The International Conference of Austroasiatic Linguistics (ICAAL) is a biennially convening open scholarly forum on the languages, linguistics and prehistory of Austroasiatic language communities. The 1st International Conference on Austroasiatic Linguistics (ICAAL 1) was held at the University of Hawai‘i in Honolulu in 1973. The proceedings of this conference were published in 1976 in two volumes under the title Austroasiatic Studies, edited by Philip N. Jenner, Laurence C. Thompson and Stanley Starosta (Honolulu: Oceanic Linguistics). The 2nd International Conference on Austroasiatic Linguistics (ICAAL 2) was held at the Central Institute of Indian Languages in Mysore in 1978. A bound set of mimeographed papers from this conference is kept in the Cambridge University library. The First Long Pause set in after ICAAL 2. At the conclusion of ICAAL 1, the conference convened again at Mysore in 1978 as ICAAL 2. After the conclusion of ICAAL 2, however, no provisions were made to reconvene. At this time, political developments in Cambodia, Vietnam, Laos and China made it difficult to conduct linguistic fieldwork on Austroasiatic languages in these countries. Austroasiatic linguistics also went into a period of relative decline as empirical linguistic research and analytical language documentation went out of fashion due to the international influence of anti-empiricist trends in linguistic theory prevailing at the time. Despite the pivotal importance of Austroasiatic for our understanding of the prehistory and the ethnolinguistic demography of South and Southeast Asia, not to mention the intrinsic interest of individual Austroasiatic languages and Austroasiatic historical grammar, the only forum for scholars of Austroasiatic for decades would take the form of incidental special sessions at conferences devoted to other areally related themes. On the 30th of August 2001 on a nocturnal stroll through Périgueux, two senior Austroasiatic scholars, Gérard Diffloth of l’École française d’Extrême-Orient at Siem Reap (EFEO) and Michel Ferlus of the Centre de Recherches Linguistiques sur l’Asie Orientale in Paris (CRLAO), told George van Driem about the history of ICAAL and lamented the fact that the conference had not reconvened since 1978. 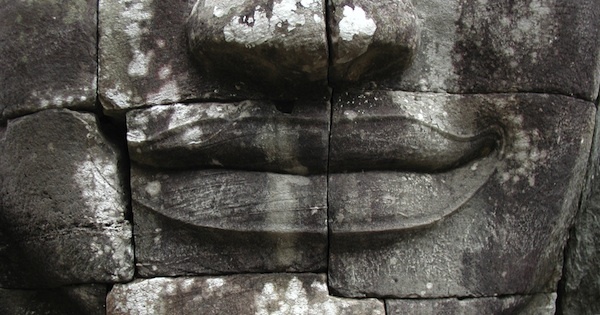 Subsequently at Siem Reap, Gérard Diffloth and George van Driem decided to raise funding from the Dutch national research council NWO and l’École française d’Extrême-Orient to convene an informal gathering called the ICAAL 3 Pilot Meeting at Siem Reap in June 2006 and revive this forum from its slumber. Michel Ferlus was unable to attend the pilot meeting, and so Gérard Diffloth became the only person to attend ICAAL 1 and ICAAL 2 as well as the ICAAL 3 Pilot Meeting and ICAAL 3. Participants at the ICAAL 3 Pilot Meeting in 2006 were Anvita Abbi (Jawaharlal Nehru University at Delhi), Roger Blench (Cambridge), Gérard Diffloth (École française d'Extrême-Orient à Siem Reap), George van Driem (Leiden University), Nick Enfield (Max Planck Institute for Psycholinguistics at Nijmegen), Keralapura Shreevinasaiah Nagaraja (Deccan College at Pune), Nicole Kruspe (University of Melbourne), Suwilai Premsirat (Mahidol University at Salaya), Long Seam (Académie Royale du Cambodge à Phnom Penh) and Therapan Luangthongkum (Chulalongkorn University in Bangkok). 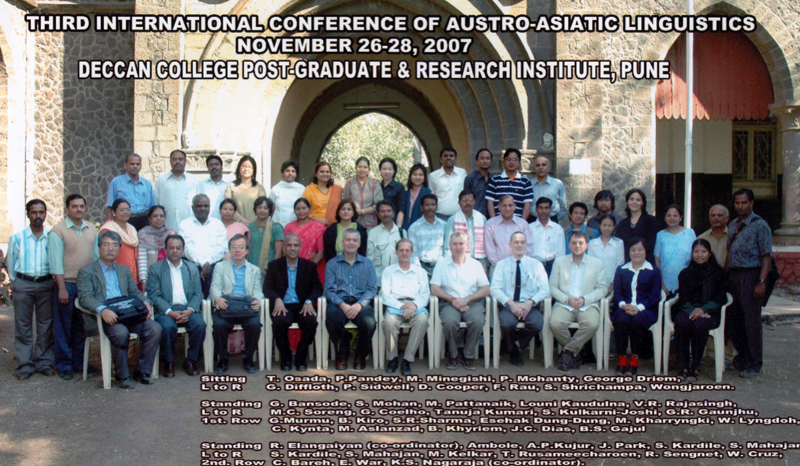 Keralapura Shreevinasaiah Nagaraja led to the successful organisation of the 3rd International Conference on Austroasiatic Linguistics (ICAAL 3), which was held at Deccan College Post-Graduate & Research Institute in Pune in 2007, and the First Long Pause had been broken. After the success of the 3rd ICAAL, the proposal tendered to the Austroasiatic Studies Group by Paul Sidwell and Doug Cooper to host the 4th ICAAL in Bangkok was accepted, since no representative of the Royal Academy at Phnom Penh attended the 3rd ICAAL at Pune. The 4th ICAAL held at Mahidol University on 29-30 October 2009. The 4th ICAAL was a marvellous event and turned out to be a great success. That year's organiser Paul Sidwell set up a website, which effectively eclipsed the original ICAAL website, i.e. the website which you are now looking at. This development was at variance with provision 8 of the ICAAL charter drawn up at Siem Reap in 2006. However, it appeared at the time that the energy and tenacity with which Paul Sidwell took the helm might benefit the sustainability of ICAAL. At the business meeting, it was decided to designate Mahidol University as the venue for ICAAL 5, to be held on 9-11 November 2011. Flooding in Thailand in November 2011, however, led to the cancellation of ICAAL 5 and to the commencement of the Second Long Pause. Fortunately, the Second Long Pause will not last as the First Long Pause, and ICAAL 5 will be held on the 4th and the 5th of September 2013 at Australian National University in Canberra. The members of the pilot group appointed the following Scientific Committee to ensure quality control and the continuity of the ICAAL: Gérard Diffloth, École française d’Extrême-Orient à Siem Reap; Nick Enfield, Max Planck Institute for Psycholinguistics at Nijmegen; Keralapura Shreevinasaiah Nagaraja, Deccan College at Poona; Nicole Kruspe, University of Melbourne; Therapan Luangthongkum, Chulalongkorn University in Bangkok; Long Seam, Académie Royale du Cambodge à Phnom Penh. It was resolved that Gérard Diffloth would chair the Scientific Committee. Any change of chairmanship can be decided at any time by simple majority vote. Decisions of the Scientific Committee are made by majority. Upon the departure of a member of the committee, the standing Scientific Committee will approach an appropriate candidate to take the place of the departing committee member. It was resolved that the ICAAL would meet biennially, and that the organising committee of any given ICAAL in any given year will, at its own discretion but in consultation with the standing Scientific Committee, designate a panel of experts for the screening of abstracts. It is the prerogative of the standing Scientific Committee to intervene if the need arises. Acting upon the generous invitation of Professor Keralapura Shreevinasaiah Nagaraja, Deccan College at Pune was designated as the venue of ICAAL 3 in November 2007. Statements of readiness were received to host the ICAAL from Mahidol University at Bangkok in 2009, from the Royal Academy at Phnom Penh in 2009, and from Paul Sidwell and Doug Cooper to host the ICAAL in Bangkok in 2009. Statements of willingness to host the ICAAL in future were expressed on behalf of the University of Melbourne, Jawaharlal Nehru University in Delhi, the National Council for Education, Research and Training in Shillong and from the Max Planck Institute for Psycholinguistics in Nijmegen in cooperation with Leiden University. This ICAAL website is to be set up and maintained by the Himalayan Languages Project. Papers presented at the ICAAL can be individually submitted to existing journals for publication, such as Mon-Khmer Studies, Bulletin de l’École française d’Extrême-Orient and so forth. Alternatively, a volume of selected conference papers and additional invited papers may be prepared by individuals who undertake such initiatives at conferences and who approach appropriate publishers on behalf of their initiative. École française d’Extrême-Orient. Website: www.efeo.fr. Himalayan Languages Project. Website www.himalayanlanguages.org.